By now, there have been many 3D printed houses and other buildings appearing across the world, but you may have noticed one thing about them: they tend to be constructed in the same areas, such as China and Dubai. There hasn’t been much in the way of 3D printed construction in Europe, at least not in terms of full-scale buildings, and that’s because of strict European building codes that have limited what would-be innovators have been able to do. Several 3D printed construction projects are in the works, but according to Danish company 3D Printhuset, none have yet begun construction on a 3D printed concrete building that meets European building codes. 3D Printhuset means to be the first. The company opened a new 3D printed construction business last fall and developed its own concrete 3D printer, putting its energy towards researching the potential for 3D printed construction in Denmark. Now that research is coming to fruition, as 3D Printhuset is beginning construction on what it is calling a Building On Demand, or BOD. The 3D printed building, which will be a small office hotel, is, according to 3D Printhuset, the first 3D printed concrete building in Europe that fulfills building codes. “Following our participation in the Danish government funded research project ‘3D Construction Printing’ and our research into and visits to over 35 3D construction projects all over the world, we saw the need for proving that the 3D print technology successfully could be applied for buildings, also in Europe and in full compliance with the strict building regulations we have here. The BOD building that we have begun constructing using on-site 3D printing of concrete in Copenhagen Harbour is that proof,” said Henrik Lund-Nielsen, CEO of 3D Printhuset. 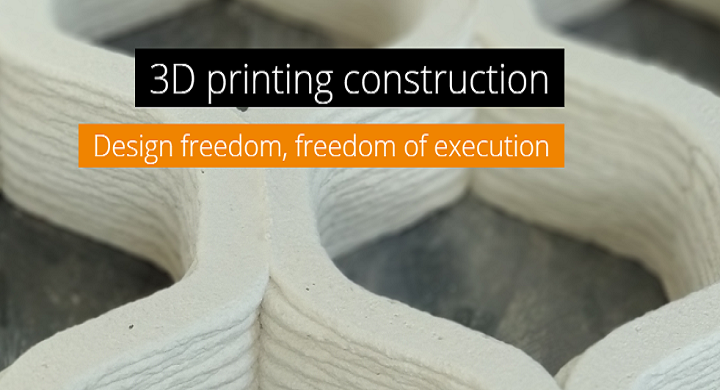 The goal of the project is to prove that 3D printing is a viable method of construction for use in Europe. The foundation for the building has already been laid, and a 3D printer is currently printing the upper part of the foundation and the walls. The printer is a gantry style 3D printer with dimensions of 8 x 8 x 6 meters and a print speed of 2.5 meters per minute. It is capable of printing layers of 20 mm height with a width between 50 and 70 mm. “We chose a gantry design rather than a robot design for the 3D construction printer for The BOD because of our prior experience with developing and making large scale FDM printers based on similar design,” Michael Holm, Development Manager at 3D Printhuset, told 3DPrint.com. The BOD was designed by architect Ana Goidea, who designed the building with curved walls and a ripple effect better showcase the organic design capabilities 3D printing allows. The building is also very environmentally friendly, in keeping with the values of the city in which it is being constructed. Copenhagen is a green-focused city with the goal of becoming carbon neutral by 2025, and the BOD itself will not only generate less waste than a traditional construction project but is being made with an assortment of recycled materials. The wall insulation is made entirely from recycled materials, and the concrete itself is formulated mostly from recycled tiles and sand. The concrete mixture was developed with help from Force Institute. 3D Printhuset plans to have the building completed this fall. On Monday, September 11th, at 3:00 PM the company will host an open reception where anyone is invited to come watch the 3D printing of the building in progress. Discuss in the 3D Printhuset forum at 3DPB.com.